The Boston Celtics are synonymous with a winning tradition. From Larry Legend, to Paul Pierce, to newcomer Isaiah Thomas, the Celtics always put a winning team on the court. But what the Celtics are doing off the court deserves attention as well. This year, the Celtics hosted the 10th Annual Seats for Soldiers Event with our help as their sponsor and AV partner. U.S. soldiers—past and present—have made, and continue to make sacrifices for the greater good of the American people. Whether they are on the front lines of a conflict or protecting the homeland, U.S. soldiers are safeguarding American values and freedom. Soldiers leave their families and friends at home in order to fight for the freedom we enjoy. Without the selflessness of American armed service members, our lives would be drastically different. For these reasons, we teamed up with the Boston Celtics to honor these men and women and provide a special experience for them and their families. 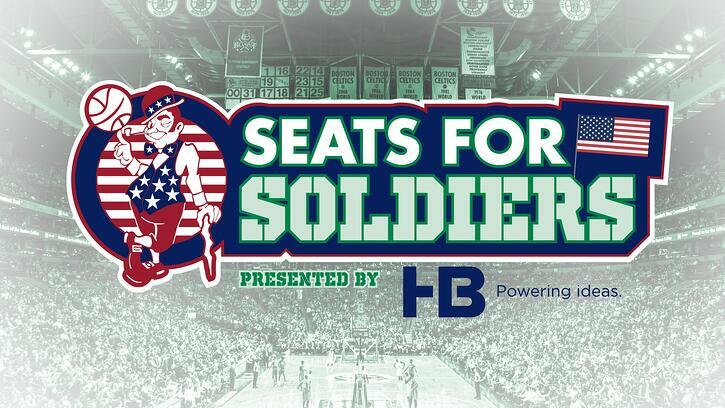 Seats for Soldiers provides service members and their families with tickets to a Boston Celtics game. The initiative also coordinates in-game opportunities for service members in attendance. For example, during halftime of the game, service members played a five-on-five pick-up game on the Celtics’ legendary court. However, the vast majority of our Armed Forces men and women are abroad and thus unable to attend this once in a lifetime experience. We couldn’t forget about them and that’s where we stepped in to help. With the latest audiovisual technology, HB communications and the Celtics provided live video conferencing in a private meeting room to enable deployed soldiers and their families to talk face-to-face on video with crystal clear audio. While the private, live video chat wasn’t the same as physically being in the room, HB Communication’s AV technology helped bridge the gap in geographical location between soldiers and their families. Providing a brief feeling of being home for the soldiers who have sacrificed so much is something that is truly humbling and rewarding. To make the communication between the soldiers and their families possible, HB Communication utilized a Starleaf video conferencing system. One of these systems was installed in the Celtics Stadium, the other was shipped directly overseas to Camp Arifjan. The night was full of highlights, but one moment in particular displayed exactly how much soldiers sacrifice to serve their country. A 2-year-old toddler waved with delight at his father through the video conference, while his mom and 8-month old brother looked on. This particular soldier was deployed shortly after the birth of his new son. This is just one example of many where we were able to connect loved ones in a meaningful way. HB Communication is proud to be able to provide deployed soldiers with the opportunity to interact with their families and friends through video conferencing, and Seats for Soldiers wouldn’t be possible without the initiative of the Boston Celtics. This Memorial Day, and every day, it’s important to remember how and why we get to enjoy the freedoms we do. Armed Service members protect our freedom on a daily basis. The sacrifices service men and women make are sometimes hard to fathom, and their selflessness and dedication is greatly appreciated. HB Communications was honored to be included in the Boston Celtic’s 10th Annual Seats for Soldiers, and we are grateful to our service men and woman, past and present.